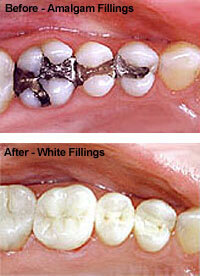 Since they bond to the tooth, composite fillings restore most of the original strength of the tooth. Silver weakens the teeth, making them more susceptible to breaking. Since broken teeth are very expensive to restore, composites can save a lot of expense over the long run. Composite fillings restore the natural appearance of the tooth. Teeth restored with white fillings are less sensitive to hot and cold than teeth restored with amalgam, if correct techniques are used. Composites are mercury-free. Mercury in the fillings is viewed by some as being toxic. Composites require less removal of tooth structure. Especially with new cavities, the size of the hole made for the filling can be dramatically smaller with composites. One caution – the composite fillings can be seriously weakened by excessive alcohol consumption. If you have a habit of drinking beverages with high alcohol content (whiskey, etc.) on a daily basis, you may find the composite fillings deteriorating prematurely.